The end result is an authentic translation of the game for the web, showcasing some of the best that HTML5 has to offer: canvas-rendered graphics, browser-based audio and video, CSS3 styling and the personality of WOFF fonts. But is that enough to justify locking certain levels to IE users? It seems a bit unnecessary to me. Stay classy Microsoft! 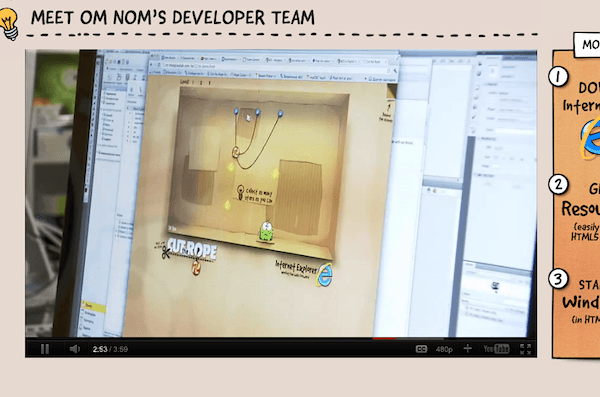 Play Cut the Rope and read about the making of. This entry was posted in Canvas (2D), Game by Seb Lee-Delisle on Posted on January 10, 2012 by Seb Lee-Delisle.